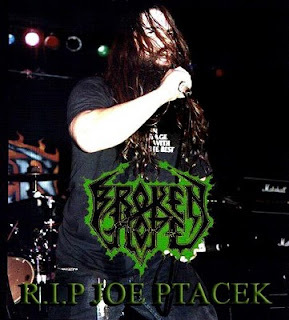 Joe Ptacek was the co-founder and lead singer for Illinois death-metal band, Broken Hope. Formed in the Chicago area in 1988, the band released five albums for Metal Blade Records before disbanding in 2002. The band had recently been discussing reforming. On January 20, 2010, Joe Ptacek died of an apparent self inflicted gun shot. He was 37 years old. "It's with profound sadness and shock that [I report that] my friend and former bandmate — Joe Ptacek — has died. "Not bad for two teenagers out of Wildwood, Illinois. "After 2000, Joe and I lost touch until just a few years ago. In recent months, we reconnected, hung out and became friends again. I just chatted with him after the New Year as he and I had found a drummer and a rehearsal spot where we were to begin working to bring back a new, resurrected form of BROKEN HOPE. "As of late, Joe was positive, healthy and had a mature and humble attitude that made me happy to see. "I'm thankful to have known him in my lifetime and to have traveled many a mile and share many a stage with such an original character. Moreover, I'm thankful to have hugged him and to have made him smile the last time we were together. Why he chose to take his life, I'll never even begin to fathom, but I pray he's in a better place. "So, to all of you extreme metal heads out there, I ask you to raise a toast in memory of Joe Ptacek, the absolute, hands down MOST BRUTAL DEATH-METAL VOCALIST EVER! "Your friend (who you affectionately called, Peck): Jeremy Wagner"
"Today the loss of my friend and former bandmate Joe Ptacek comes way too soon. "So please, remember Joe on this day and know that we all lost a great guy.